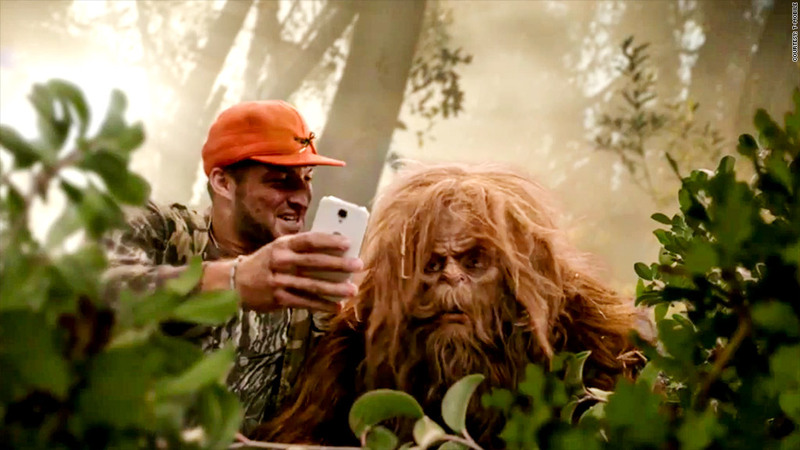 Tim Tebow takes a selfie with Bigfoot in a Super Bowl ad from T-Mobile. Tim Tebow made it to the Super Bowl after all, and he's not even in the NFL! The former New York Jets quarterback won't be playing in the game. Instead, he'll be starring in the first Super Bowl ads by telecom provider T-Mobile (TMUS). The spots make fun of the former football star's fictitious struggle to find steady work since becoming a free agent. He hasn't played a regular season game since 2012. "Still no contract, but it's all good," says Tebow, in one of the ads, where he then demonstrates his new occupations as rodeo cowboy, stunt car driver, rock star and obstetrician. He also explains how his life as a free agent gives him time to pursue the important things in life, like rescuing puppies from a burning building, playing football on the moon and venturing into the woods to "tackle the unknown," which he demonstrates by tackling a Yeti. "Bottom line, contracts hold you back," says Tebow. Then, an anonymous voice-over intones, "Switch to T-Mobile, and we'll buy you out of yours." T-Mobile is running three 30-second spots during the big game on Sunday, with Tebow appearing in two of them. The ads promote the company's recently launched offer to cover the costs for anyone breaking a contract with their current network provider to switch to T-Mobile, up to $650 per contract. "We really wanted to use the platform of the Super Bowl to really bring forth our message of no contract to the mass audience the Super Bowl reaches," said Peter DeLuca, senior vice president of brand communication for T-Mobile. At this year's Super Bowl, the Seattle Seahawks face the Denver Broncos at the MetLife Stadium in East Rutherford, N.J.